Until only recently, Mário Pedrosa’s body of work in the United States was mostly confined to intellectual conversations and academic citations. 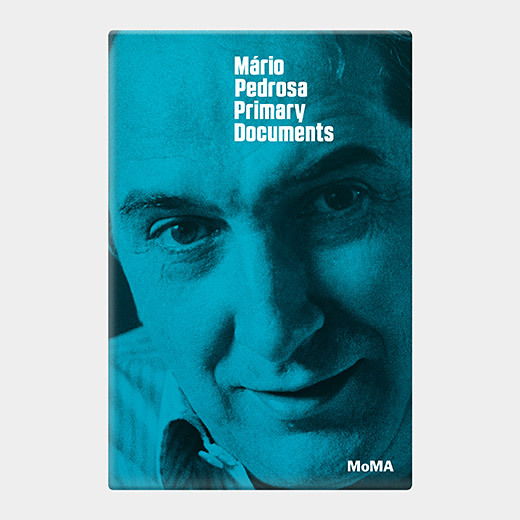 A substantial step towards making the ideas of the prominent Brazilian art critic more accessible to the general American public has just been materialized with the release of the book “Mário Pedrosa: Primary Documents”. Published by MoMA (Museum of Modern Art), the book is the first English publication to offer a comprehensive overview of his writings. It includes his correspondence with prominent political personalities and artists – such as Lygia Clark, Hélio Oiticica, Oscar Niemeyer, André Breton, Alexander Calder, Ferreira Gullar, Luiz Inácio Lula da Silva, and Leon Trotsky – as well as newly commissioned essays by relevant academics, such as Aracy Amaral. Born in the early 1900’s, Pedrosa’s influence and career spans over 60 years and 3 continents – he lived, in different moments, in Germany (Berlim), France (Paris), the United States (New York ), Chile and Cuba. Throughout his life, he combined political militancy, being a fervent supporter of communism, with an active engagement with the Brazilian modernism since the early years. Pedrosa saw the movement’s flourishing in art and architecture and founded the Modern Artists Club, in 1932. He responded to the works of Candido Portinari, Tarsila do Amaral, Alfredo Volpi, among numerous other modern artists. Pedrosa followed with enthusiasm the construction of Brasília and the architecture of Oscar Niemeyer. He founded the Art Critics Association of Brazil and participated in the commission that organized the first Sao Paulo International Biennials in the 1950s and 1960s. His correspondence with Lygia Clark and Hélio Oiticica, in 1960s, discloses his active role in articulating the groundbreaking neoconcrete movement, which to this day influences contemporary artists around the world. The power of Pedrosa’s words lies within his openness to experimentation and radical critical thinking. Pedrosa’s words are to be read, but are also to be seen, in their ubiquitous presence within the practices of the artists he so intensely advocated for. Tatiane Rosa is a Brazilian writer and curator who lives in-between New York and California. She has an MA in Contemporary Art History, an MFA in Art Criticism and Writing from SVA-NY and she’s a PhD Student in Visual Studies at UC Santa Cruz, CA.